Hello there! How are you today? Have you checked out the March Nail Artist of the Month yet? If not, please check it out below today's post! Since it's March, I'm in the process of making my blog St. Patrick's Day themed, so I have deleted all snowflakes and gone a tad green. I'm not 100% happy where it's at right now, but it's a work in progress! In a day or so it will be perfect! Today is again Tuesday, which means it is time for another Twinsie Tuesday post! 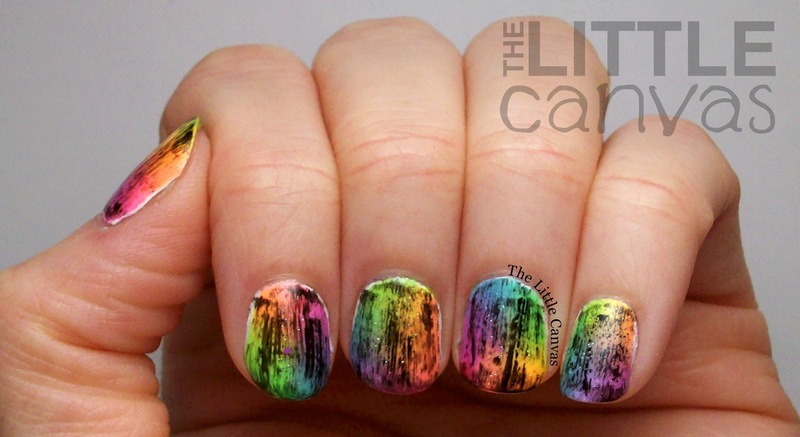 Our prompt for today is grunge nails! In January, I posted my first ever grunge look on the blog. 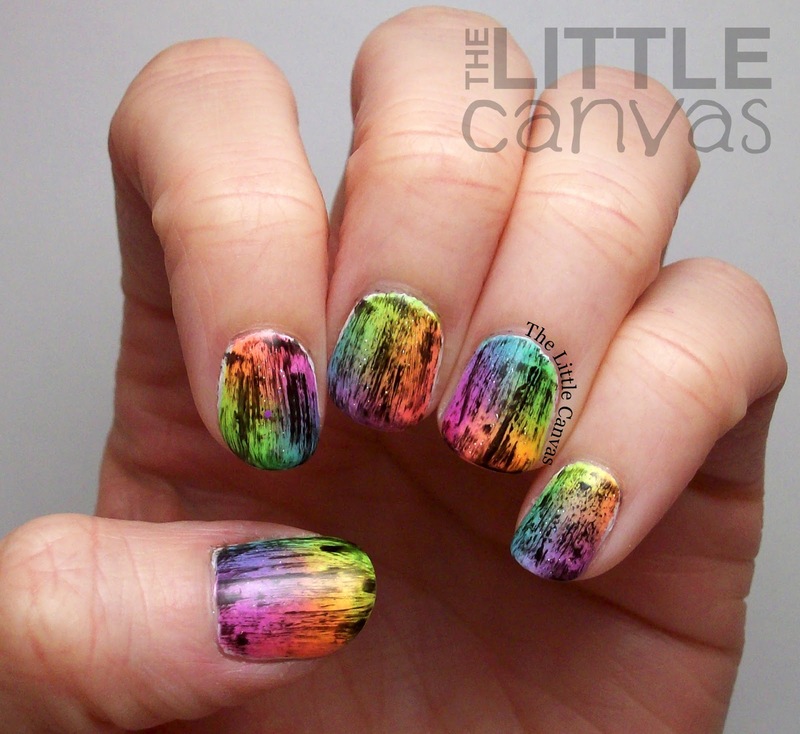 In this post, I followed the tutorial by the talented Sarah of Chalkboard Nails. It's one of my favorite posts because Sarah commented on my blog and I had a minor fan girl moment. When I saw that today's prompt was grunge, I was really excited to re-create the design again, but a tad apprehensive because I wasn't sure what colors to do! 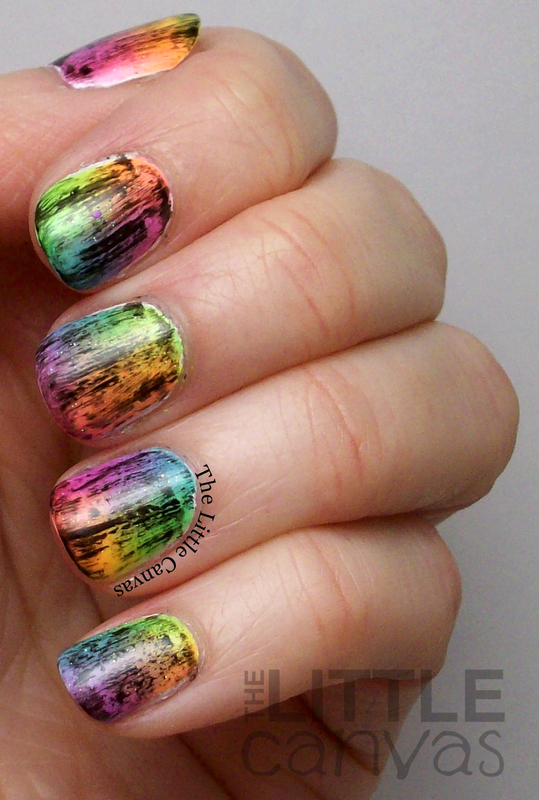 While I was re-reading my old post and looking at my blog, my eye caught the manicure to the far left of my banner. That mani being this bright neon gradient zebra manicure which was inspired by my fellow Twinsie, Heather of Peace, Love and Polish. Once I saw that gradient, I knew that had to be the base for today's grunge look! Really awesome looking, right?! To get the look, I started off with a base coat of white polish. While my white polish was drying, I started taping off around my cuticle so I didn't have to deal with the nasty clean up which usually comes from applying a gradient. I really should invest in some nail bibs. After my nails were dry and my fingers were taped off, I started painting all six neons onto my make-up sponge kind of in a circle. When I had enough paint on my sponge, I started dabbing onto the nail. Since I had the white base, the neon polishes really popped. 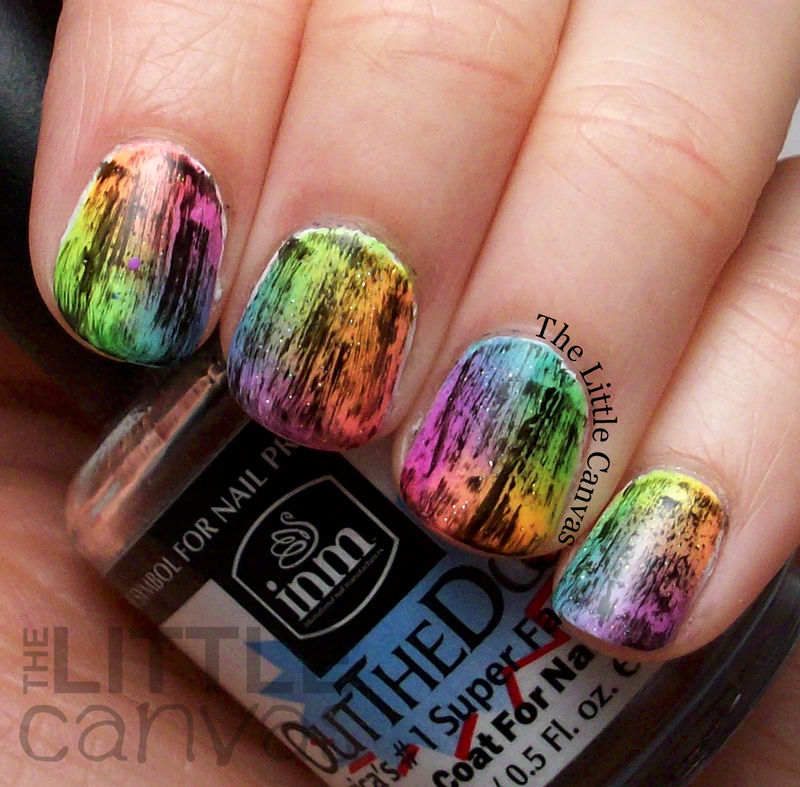 Once I was happy with the colors, I added a quick coat of INM Northern Lights. Then came time to "grunge" my nails up. I grabbed my black polish and followed Sarah's tutorial. I wiped all the black polish off the brush, then lightly swiped it over each nail. Finished with a top coat and called it a day! I truly love this manicure!! Huge thanks to Sarah for introducing me to the grunge look, and a bigger thanks to Heather for introducing me to the rainbow gradient. If it weren't for these two lovely ladies, this manicure probably never would have been created. Thank you both for continually inspiring me! I cannot wait to see the other Twinsie's grunge looks! 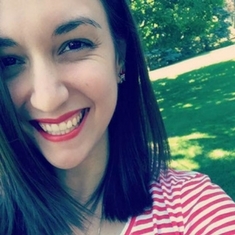 I hope you all head on over to their blogs and take a look!